I'm by no means an expert canner, but I'm pretty adept with pickles and jams and things involving tomatoes. But I don't fly solo - canning is a science, and you need the right level of acid and salt so the canned products don't go bad. 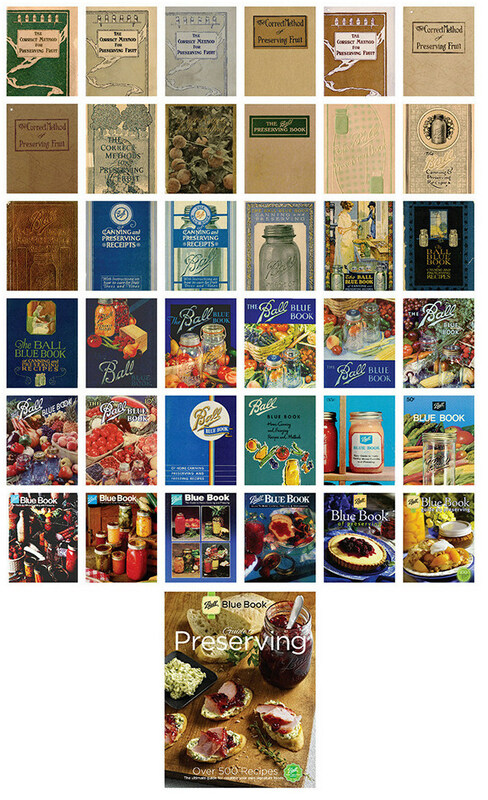 My go-to book for most recipes is the Ball Blue Book. And this year, there's a new version (the 37th edition! 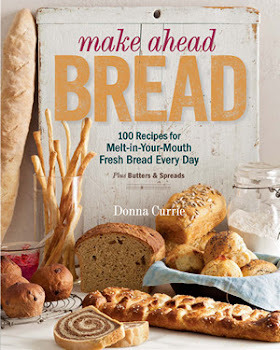 ), with a whole new section called Meal Creations as well as individual new and updated recipes. 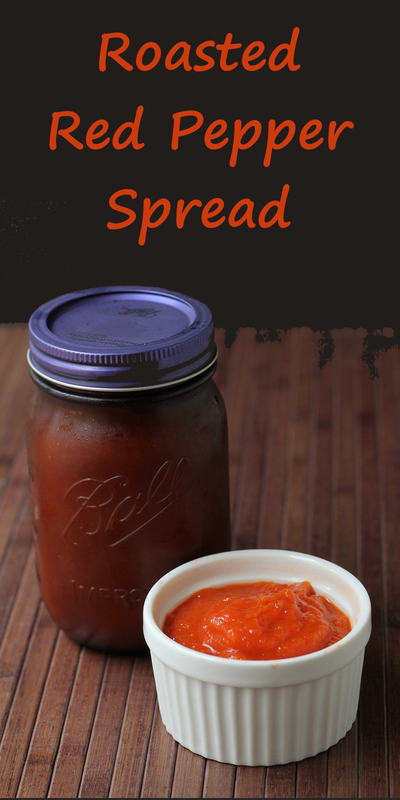 It's worth looking into if you plan on doing any canning. And, I have a copy of the newest book for one lucky reader, plus an extra bonus! Here are the covers from all 37 issues - the large one at the bottom is the new edition. I actually have a few different editions, and I still use them. How many do you have? So the point of this post - besides sharing a delicious recipe, is to let you know that for the fifth year in a row, Jarden Home Brands will host Can-It-Forward Day, this year on August 1, broadcast live at FreshPreserving.com from 11am to 4pm EST. AND - If all goes well, technically, I'll be hosting the webcast here, as well. So you don't need to wander too far! 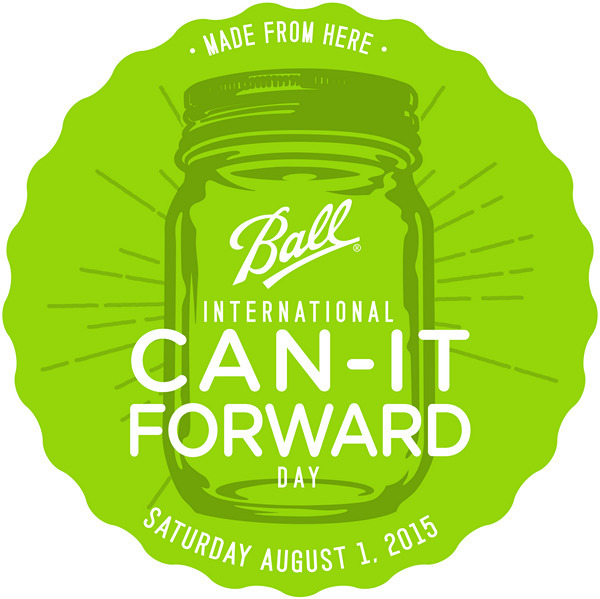 Can-It-Forward Day encourages gardeners & food enthusiasts across the country to celebrate what “Made From Here” means to them by fresh preserving their favorite local ingredients in peak season. The webcast will have an integrated chat function where consumers can submit their home canning questions to be answered in real time. New this year, there will also be an exciting celebrity mason jar auction unveiled during the webcast! But enough about that. Let's get to the recipe! 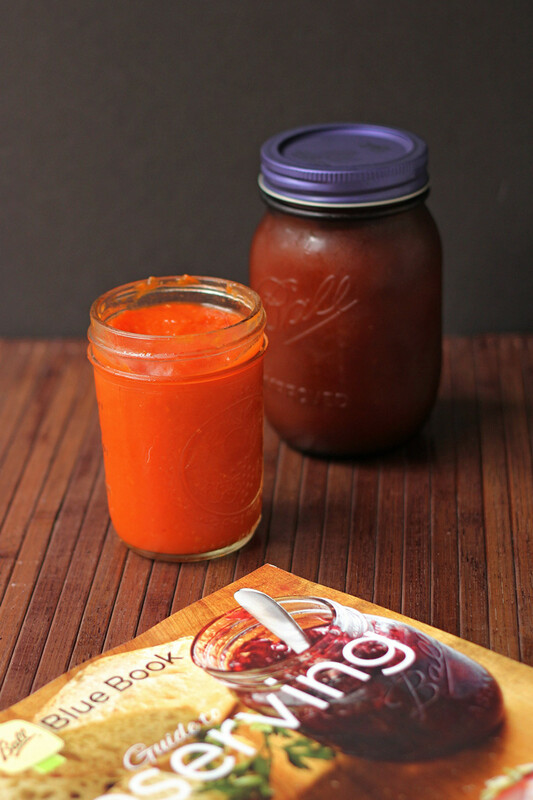 As I was paging through the book, I spotted a recipe for a roasted red pepper spread that sounded perfect. 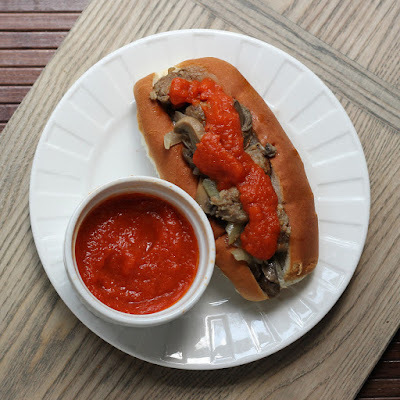 I love roasted red peppers on sandwiches and in recipes, so I figured the spread would be just as good. But of course, I can't leave things be. I decided that I didn't want to make a full recipe, and I decided not to can it at all. The original recipe made 5 half-pints of spread, or about a quart-and-a-half. I figured that if I made half of a batch, I'd have no trouble using it in a short time. So far, I've used it as a sauce on chicken ... in the place of tomato sauce for a chicken parmigiana dish. You can find the recipe for the chicken here. And on a sandwich. This was Italian sausage, mushrooms, and onions on a soft bun. I'm planning on using it as a sauce on pizza, and I'm thinking about making red pepper soup. And about that time, I'll need to make more. Besides cutting the recipe in half, I made a few other adjustments. I accidentally used 1/4 cup of onions, but it really should have been just 2 tablespoons for half of the recipe. And the original recipe called for basil, which I didn't use. I knew that I could easily add basil later, and wanted the peppers to be star of the show. If you make this from the book, I suggest weighing the peppers and tomatoes to make sure you have the right amounts, since product sizes can vary a lot. The book estimated 12 red peppers for 6 pounds, but I only needed 5 for 3 pounds. It estimated 10 roma tomatoes for one pound, but mine were pretty huge, so I only needed 2 for half of the recipe. Wash the bell peppers and tomatoes. put the peppers on a baking sheet. Place them under your broiler, and cook, turning as needed until the skins are blackened in spots on all sides. When the peppers are done, place them in a paper bag and close it or put them in a large bowl and cover the bowl. The steam from the peppers will make the skins easy to remove. Let them rest until they're cool enough to handle, then peel them, remove the cores and seeds, and put them in your food processor. Meanwhile, place the tomatoes, garlic, and onion (you'll need about 1/2 of a medium onion) on another baking sheet and broil, turning as needed, until the tomato skins split and the garlic and onion have brown or black spots on the skin. Place the tomatoes in a bag or bowl as you did with the peppers and let them cool until you can handle them. Peel the garlic and chop it roughly and place the pieces in the food processor. Peel the onion, chop, and measure 1/4 to add to the food processor. When the tomatoes are cool enough to handle, peel them, remove the core chop them roughly and add to the food processor. Puree the ingredients in the food processor, then transfer the mixture to a heavy-bottomed saucepan. Add the sugar, salt, and vinegar. Heat on medium until the mixture comes to a simmer and continue cooking until the mixture thickens. It needs to reduce a lot to become a spread. Taste for seasoning and add more salt. I thought it needed just a tiny bit more. I stopped when I had 1 1/2 pints of product, and it was a thick sauce rather than a spread, but it was really tasty. Based on the original recipe amounts, I should have continued reducing until I had 1 1/4 pints. But then again, it was really good as a sauce, so I'm fine with it as it is. Next time I might continue reducing further. Transfer to jars, cover, let them cool to room temperature, then refrigerate. Thanks to Jarden for sponsoring this post! 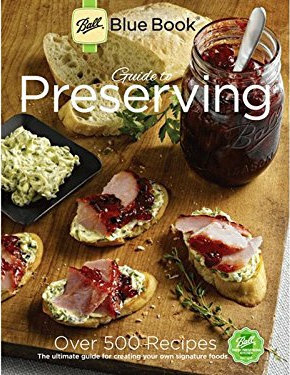 I will be mailing the cookbook to the winner; Ball will mail a coupon for the canning jars.